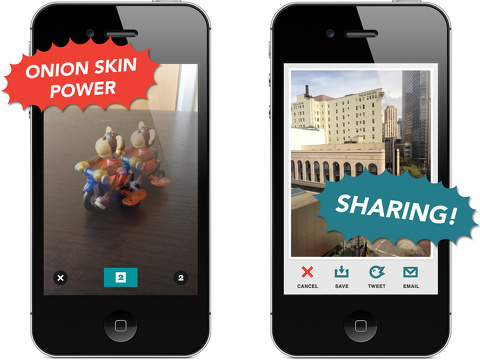 Are you looking for an app to create animated GIFs that requires three touches on the screen? Yes, that’s all it takes. Jittergram could be the easiest iPhone app that generates animated GIFs. When you open the Jittergram iPhone app, the in-app camera is active. There is a button at the bottom of the screen to snap the first photo. Then, you can see the first image lightly outlined, as you shoot the second photo. If you are satisfied, you touch the check icon, and you can see your animated GIF. The first image moves towards the second image rapidly. If you want the animated GIF to move in the opposite direction, you touch the infinity icon. It allows you to shoot the second image, then the first. The Jittergram iPhone app has simple options to save and share, as well as delete. There are one touch options to cancel, save, share, and email in the menu bar at the bottom of the screen. You save each of the images to your iPhone camera library, but the animated GIF is not viewable in your iPhone library. You can share your animated GIF by email and text message, as well as Twitter and Facebook. A one-touch share option to Tumblr would make a lot of sense for the Jittergram iPhone app. Until then, you’ll have to copy it to the clipboard and post within your blogging iPhone app. The Jittergram iPhone app does not require you to participate in its own social network, but it is simply a tool to express yourself to your existing social networks. 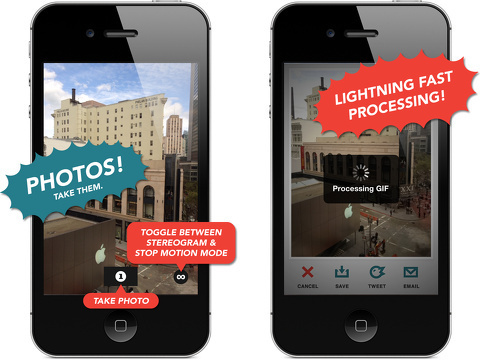 Jittergram’s iPhone app is fun, functional, and surprisingly free. AppSafari review of Jittergram was written by Jenni Ward on November 6th, 2012 and categorized under App Store, Featured, Free, Photos, Video. Page viewed 4625 times, 1 so far today. Need help on using these apps? Please read the Help Page.